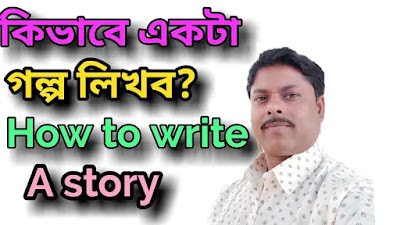 Hi students today we will discuss about how to write a good story for the Madhyamik and 11 class students. 1) story is usually written according to the original hints. 2) The hints must find out the main characters. 3) In the title of the story, title must be entered in the name of that character. ** Let's start the story, how do I start? B) One day a / an / two names of main characters / characters were / were to describe their work. After reading the hints, then the story will be arranged according to the incident. Usually not all events occur at the hints. So they have to think about what they might be. Then it will be written in the story. In each sentence, the subject - verb - object - part of the remainder hints will be written using sentence. If you can use Direct Speech occasionally. And write them in a separate paragraph. Here is an example that will be of great benefit to you. A farmer - bought a house- - laid golden eggs everyday - - farmer became greedy - - wanted all eggs at a time - - killed the Goose - - got nothing. Presently it should be presented correctly. Once there lived a farmer in a remote village. One day he bought a Goose from from the market. The Goose used to lay Golden egg everyday. The farmer used to sell it is a market and got a lot of money. The farmer was happy. But the farmer was very greedy. he was not satisfied with single egg a day. he wanted to be rich at a time. He thought how he could become rich very quickly. Suddenly a plan hit upon his brain. He decided to kill the goose by cutting its belly. So he killed the Goose but alas! he got nothing as well as lost his goose. He repented for what he had done. Moral : greed causes decline.